We are committed to King Will's credit worthiness and hope all the rings can keep a good condition, so that we provide LIFETIME WARRANTY. But it normally only covers issues that were built-in to product itself, excluding the damage result from buyers themselves. Fill a bowl with lukewarm water, and add some mild dishwashing liquid. Soak your titanium ring or other jewelry in the solution for about 5 minutes, and then gently rub the dirt off the pieces with a soft cloth. After your jewelry is clean, rinse it with water and dry it with a clean towel (leaving titanium pieces to air dry may cause them to spot). As you wear your titanium jewelry, it will inevitably scratch over time. Although this metal is very durable and hard to damage, it is not completely scratch resistant.Avoid wearing titanium jewelry when you are in the shower or in the swimming pool. The chlorine found in the water can damage your titanium jewelry. When taking off titanium ring, you can place it inside the free ring box and then put the box in a safe space. Measure your finger size before purchase, for titanium ring can not be resized. We have offered the easy way to measure your finger size on detail page. We would like to suggest you have your finger sized at a jewelry store for an accurate ring size. 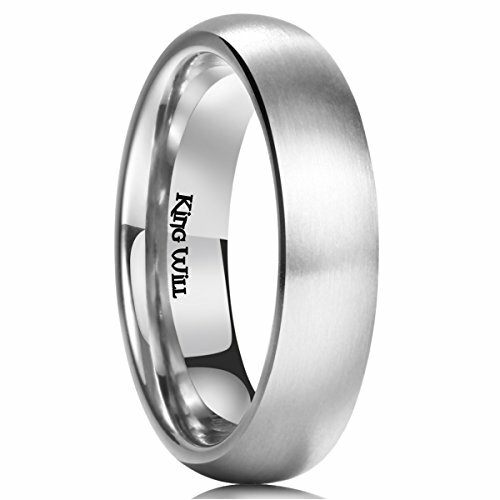 King Will's original design, a new alternative to the wedding rings is not responsible for Replica or other inferior quality product.